Mar. 9, 1864 Gen. Grant named commander-in-chief of all Union armies, replacing Gen. Henry Halleck, an able administrator but an ineffective strategist. Halleck remained in Washington in an administrative capacity as chief of staff. Gen. William Tecumseh Sherman became commander of Union forces in the west. The Union plan now called for Gen. Grant to attack Lee’s army in Virginia, while Sherman was to attack Gen. Joseph Johnston and take Atlanta. Apr. 12, 1864 Fort Pillow Massacre Infamous racial incident at Fort Pillow, on the Mississippi, north of Memphis, Tennessee. 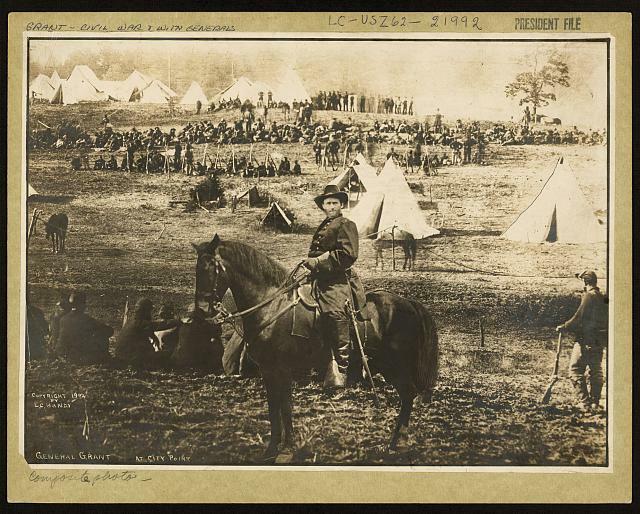 Confederates under Gen. Nathan Forrest stormed the fort and many of its defenders, half of whom were black, were killed. Forrest was accused of allowing his men to massacre the black Union troops after they had surrendered. May 5-June 12, 1864 Wilderness campaign in Virginia. This series of battles opened Gen. Grant’s drive to defeat Lee’s army and capture Richmond. Leading the 118,000-man Army of the Potomac, Grant march south from Culpeper, Va., and entered a heavily wooded area near Fredericksburg called the Wilderness. Some 60,000 Confederate troops led by Gen. Lee advanced to meet Grant in the Wilderness, and the ensuing battle (May 5-6) became a bloody, inconclusive draw, thanks to Lee’s skillful maneuvering and the timely arrival of Confederate Gen. Longstreet’s troops. Casualties numbered 18,000 Union dead and wounded and 11,000 Confederates. Attempting to move around the Confederate right, Grant next marched southeastward toward Spotsylvania Courthouse. But Gen. Lee anticipated the move and dug in there. Grant’s relentless attacks at Spotsylvania (May 8–21) included a frontal assault on the “Bloody Angle,” defensive works in the Confederate center. The trench warfare at Spotsylvania cost 12,000 Union casulties. Grant’s thrusts and Lee’s parries continued southward toward Richmond in a relentless war of attrition. 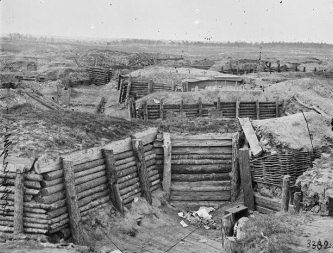 At the Battle of Cold Harbor (June 1–3), Grant again attacked Confederate trenches with terrible losses, including 12,000 casualties in one day (June 3). Changing his battle plan, Gen. Grant broke off his attacks on Lee’s army and moved southward, crossing the James River on a hastily built pontoon bridge, laid down at Weyanoke, to attack Petersburg just south of Richmond. Grant intended to take Petersburg, thereby cutting Confederate supply lines to Richmond, and then to attack Richmond itself from the south. The Wilderness campaign cost Grant dearly, some 60,000 casualties in a single month (beginning May 12), to Confederate losses of about 25-30,000. But Grant could replace his losses. Lee could not. Battle scene at Cold Harbor. 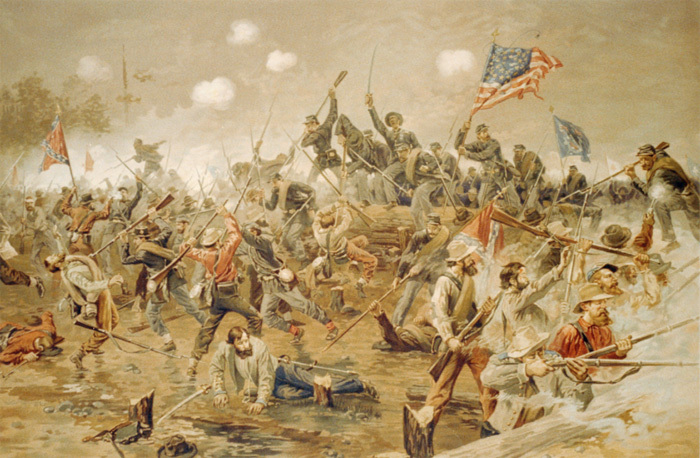 Fighting at Rebel Spotsylvania defenses called the "Bloody Angle." May 7-Sept. 2, 1864 Atlanta Campaign Series of battles fought by Union forces to capture Atlanta, Georgia. Gen. Sherman began marching his 100,000-man army from Chattanooga toward Atlanta on May 7. He was opposed in a long series of battles by Gen. Joseph Johnston (replaced by Gen. John Hood, July 17), commanding a smaller Confederate force of some 60,000 men. 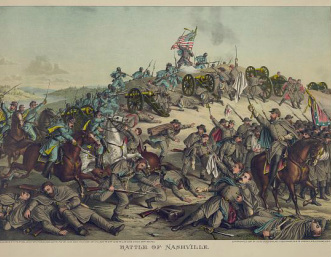 These battles included engagements at Kennesaw Mountain (June 27), a bloody Union attack that cost Sherman 2,000 casualties to fewer than 300 Confederate losses. Peachtree Creek (July 20) and Atlanta (July 22) followed with heavy Confederate losses, before Hood was forced to retreat into Atlanta itself. Thereafter Sherman began heavy bombardment of the city and gradually extended Union positions around it. Sherman finally forced Gen. Hood to abandon the city, and occupied it Sept. 2, 1864. Atlanta’s fall figured in President Lincoln’s successful reelection campaign that year. 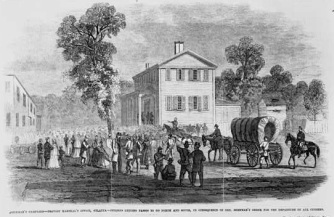 Evacuation of Atlanta ordered by Sheman. 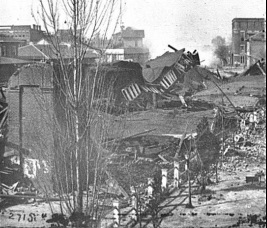 Atlanta railroad station destroyed by Sherman. June 10, 1864 Brice’s Cross Roads Some 3,500 Confederate cavalrymen led by Gen. Nathan Forrest defeated a Union force of nearly 8,000 in a raid at Brice’s Cross Roads in Mississippi. 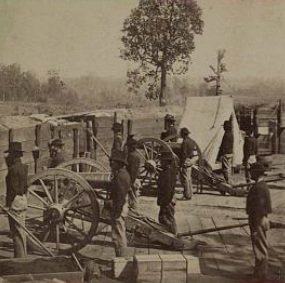 Artillery on the siege line at Petersburg. June 15, 1864-Apr. 1865 Petersburg Campaign After the Battle of Cold Harbor, Gen. Grant attempted to bypass Lee’s army by marching south and attacking Petersburg, which defended the southern approach to the Confederate capital at Richmond. Grant’s advance elements were stalled by a small Confederate force under Gen. Beauregard, giving Gen. Lee time to maneuver his troops into defensive positions. Grant’s four day attack (June 15-18) at Petersburg failed to dislodge the Confederates. Stalemated, Grant then began his nine-month siege of the city, a grueling battle of trench warfare. In an early attempt to break through Confederate defenses, Union troops dug a mine under Confederate lines and exploded a huge cache of dynamite. 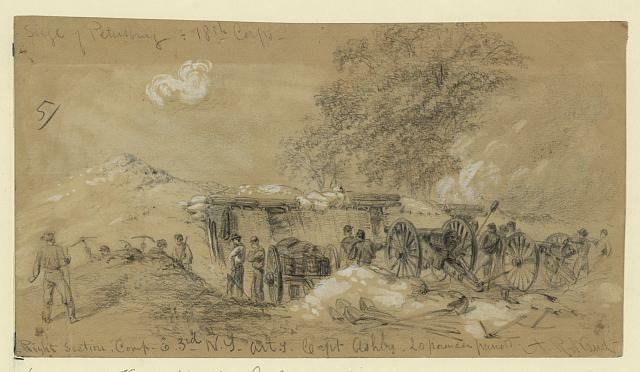 The resulting Battle of the Crater (July 30) turned into a disaster for Union troops, though. Storming ahead into the crater, the Union troops were fired upon by Confederates up on the crater’s rim. The battle for Petersburg thereupon degenerated into long months of trench warfare. Gen. Grant slowly pushed his lines westward to cut Confederate supply lines to the south, forcing Lee to extend his already thinly manned defenses. Outnumbered, short of supplies, and plagued by desertions, the Confederates nevertheless continued to hold out. Finally on Mar. 25, 1865 Gen. Lee made a desperate attempt to break out to the east, only to be beaten back by Union forces. 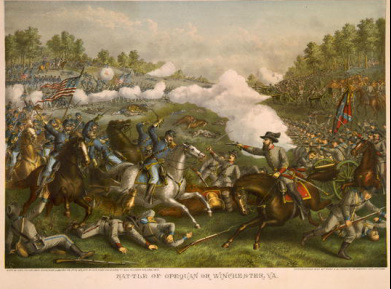 Days later, another attempt failed, when Union troops under Gen. Philip Sheridan routed Confederate Gen. George Pickett’s troops at the Battle of Five Forks (Apr. 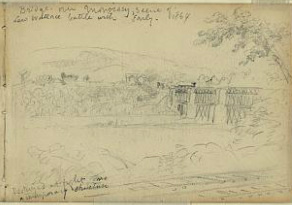 1, 1865). Sheridan captured some 5,000 Confederates in what was to be the last major battle of the Civil War. 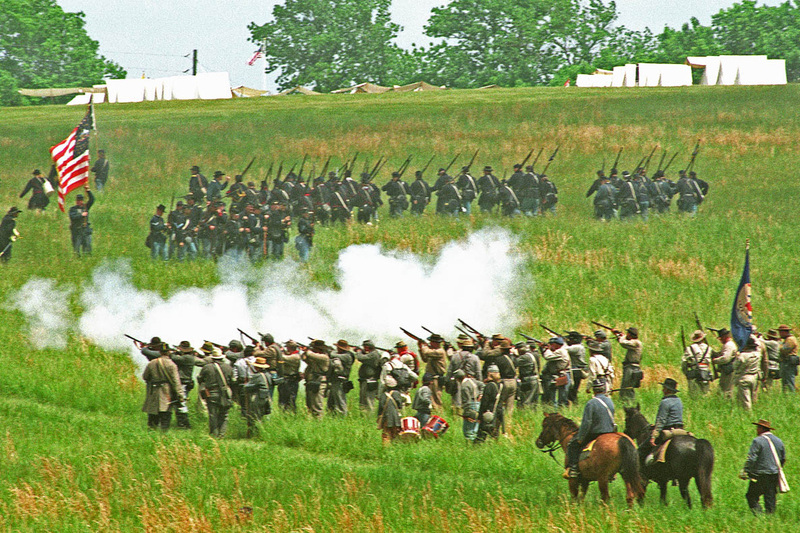 Union armies then assaulted and finally breached Confederate lines at Petersburg the next day (Apr. 2), resulting in the fall of both Petersburg and Richmond (Apr. 3, 1865). Gen. Grant at his City Point headquarters. Battle scene at the siege of Petersburg. Confederate defensive works at Petersburg. 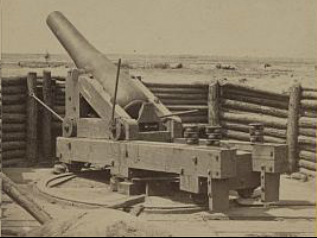 Confederate artillery emplacement at Petersburg. Battle of New Market reenacted. While the Union siege of Petersburg was still in its early stages, Union forces drove southward into the rich farmlands of the Shenandoah Valley, a breadbasket for feeding the Confederacy. At first badly defeated at the Battle of New Market (May 15, 1864), the Union army enjoyed greater success under its new commander, Gen. David Hunter. Hunter’s troops soundly beat Confederate Gen. W. E. Jones’s forces at the Battle of Piedmont (June 5, Jones was killed in the battle). Pushing south, Hunter briefly occupied Staunton, Va. (June 6-10), an important Confederate supply depot. Union troops pillaged and burned military and other buildings there before again marching south to sack Lexington and then threaten Lynchburg. Before Hunter could attack Lynchburg, however, Gen. Jubal Early and his Second Corps arrived by train from Richmond. 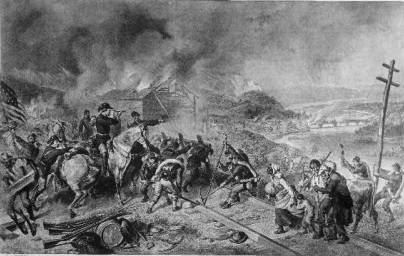 Early quickly drove Hunter’s army out of the valley and into West Virginia (June 16-18). Early next marched his forces northward through the valley to Maryland and then eastward to threaten the Union capital of Washington, D.C.. At the Battle of Monocacy (July 9, 1864), fought near Frederick, Md., Early’s 14,000-man army defeated some 6,000 federal troops led by Gen. Lew Wallace. But the action slowed Early’s advance on Washington and thus gave Gen. Grant time to strengthen the capital’s defenses. Early advanced to within a few miles of the capital (threatened but did not attack Fort Stevens, July 11- 12) before the arrival of additional Union troops forced him to withdraw. Operating out of the Shenandoah Valley, Early next launched a series of raids from July onward, most notably one in which he burned Chambersburg, Pa. (July), after the town refused his ransom demands. Grant then sent Union Gen. Philip Sheridan, commanding the Army of the Shenandoah, against Gen. Early. Sheridan defeated Early at Winchester (Sept. 19) and Fisher’s Hill (Sept. 22). 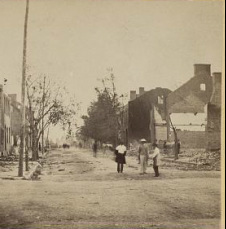 Sheridan then began a scorched earth campaign in the valley (Oct. 5), burning warehouses, barns and mills, and otherwise wrecking anything that might be of use to the Confederacy. A surprise Confederate attack at Cedar Creek (Oct. 19) nearly routed Sheridan’s army, but Sheridan managed to turn the tide and badly mauled Early’s army. Early withdrew south to winter quarters at Fishersville, but the end was fast approaching. Gen Sheridan crushed Early’s remaining troops at the Battle of Waynesboro (Mar. 2, 1865), ending Confederate control of the valley. Railroad bridge at Monocacy where Early fought Wallace. Gen. Sheridan's army following Early up the Shenandoah Valley. 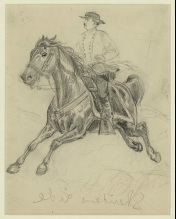 Gen. Sheridan's ride to rejoin his troops saved the day for Union troops at Cedar Creek. 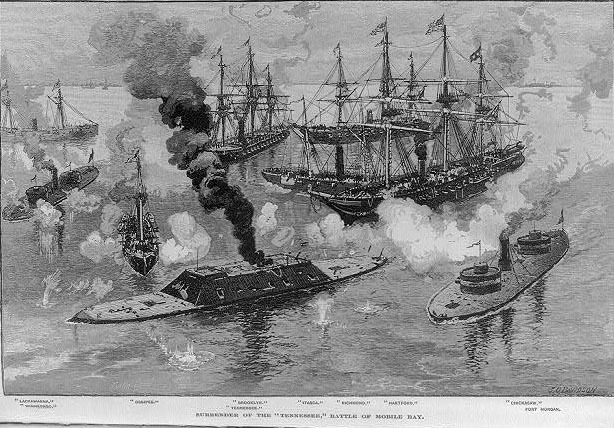 1864 Battle of Mobile Bay An important Union naval victory for Commander Farragut (Aug. 5), which sealed off the Confederate port of Mobile, Alabama. During this attack he shouted his famous words, “Damn the torpedoes. Full speed ahead!” urging his fleet forward despite the presence of mines (the torpedoes) in Mobile Bay. 1864 Saint Albans Raid Some 25 Confederate raiders marching from Canada (Oct. 19) attacked the town of Saint Albans, Vermont. They robbed three banks, killing one man, and escaped into Canada. Canada refused to return the raiders, but the money they stole was returned. 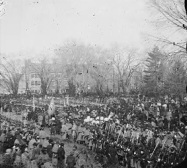 The scene at Lincoln's 2d inauguration. 1864 President Lincoln reelected (Nov.). 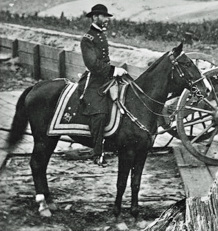 Abraham Lincoln’s reelection campaign had suffered as a result of the heavy losses in the Wilderness campaign and the stalemated siege at Petersburg, but Sherman’s victory at the Atlanta provided a timely boost, helping him secure another term. Lincoln’s reelection was seen as a serious blow to what remaining hopes the Confederates had for a victory. 1864–65 Sherman’s March to the Sea (Nov. 15–Dec. 21). Commanding an Army of 60,000 soldiers, Union Gen. Sherman marched southeast across Georgia from Atlanta, laying waste to a 60-mile-wide swath of warehouses, factories, and other buildings, railroads, and bridges--in short anything that might be of use in supplying the Confederacy. Union soldiers, given license to “forage liberally,” also looted the defenseless civilians in their path. Savannah fell (Dec. 21). 1864 Hood’s army destroyed at the Battle of Nashville, Tenn. (Dec. 15-16). Unable to attack Sherman directly, Confederate Gen. Hood sought to disrupt his long supply lines emanating from Tennessee. Confederates first attacked Union elements led by Gen. John Schofield at Franklin, Tenn., (Nov. 30) only to be routed with losses of 5,000 casualties to the Union’s 1,200. Union troops led by Gen. George Thomas then delivered the coupe de gras in the Battle of Nashville (Dec. 15-16).